With the presence of a large pool of participants, the global Pyrogen testing market is displaying a highly competitive business landscape, finds a new research report by Zion Market Research (ZMR). Thermo Fisher Scientific, Charles River Laboratories Inc., Lonza Group, and Wako Chemicals USA Incorporation are some of the key vendors across the world. These players are focusing aggressively on innovation, as well as on including advanced technologies in their existing products. Over the coming years, they are also expected to take up partnerships and mergers and acquisitions as their key strategy for business development, states the Pyrogen testing market study. In a major breakthrough that can create ripples across Pyrogen testing industry, in May 2018, MilliporeSigma and Solvias decided to enter into collaboration for providing PyroMat System, an innovative monocyte activation test kit developed by both firms for Pyrogen detection, to customers. As estimated in this report, the global Pyrogen testing market stood at US$ 564.4 million in 2015. 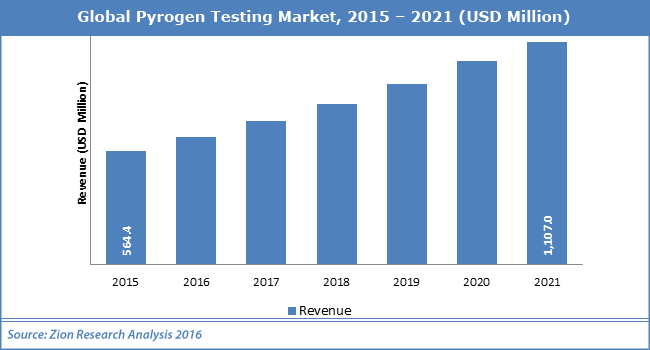 Witnessing a tremendous rise during the period from 2015 to 2021, the revenue in this Pyrogen testing market is expected to reach US$ 1,107 million by the end of the forecast period. The main products available in this Pyrogen testing market are kits & reagents, instruments, and services. Among the three, the demand for kits & reagents is relatively higher and the trend is anticipated to remain so over the next few years, notes the Pyrogen testing market research report. “Introduction of new drugs and rise in the R&D activities witnessed across pharmaceutical and biotech sectors are anticipated to spur the Pyrogen testing market size over the coming years,” says the author of this study. Apart from this, massive funding of research & development activities pertaining to drug development along with favorable government policies stimulating the growth of Pharma & biotech industries will further boost the industry trends in the years ahead. Lack of healthcare amenities and low availability of advanced Pyrogen testing devices however, is anticipated to obstruct the Pyrogen testing market growth over the forthcoming years. Nevertheless, the increase in the number of outsourcing activities observed across the pharmaceutical sector is projected to generate a profitable roadmap for Pyrogen testing industry over the ensuing years, normalizing the impact of hindrances on the Pyrogen testing market, reports the Pyrogen testing market study. Regionally, North America has been leading the worldwide Pyrogen testing market and is anticipated to continue on the dominant position in the years to come, states the Pyrogen testing market study. The presence of a well-established medical and healthcare infrastructure and skilled healthcare professionals has played a vital role behind the dominance of the North America Pyrogen testing market. The high number of market players being headquartered in North America is another significant factor that is supporting this regional Pyrogen testing market. Furthermore, various firms in the region are focusing on new drug development activities, which will further propel the industry growth.